“Chronicle of Hope” that has supported imprisoned activists since 1980. Nuclear Resister supporter MacGregor Eddy has set a goal to enroll 100 new subscribers by December 1, 2014 – International Prisoners for Peace Day. The Nuclear Resister supports imprisoned activists and those on trial. It is a unique information clearinghouse about their acts of conscience. Subscribe for yourself, or for a friend, a library, a peace center, lawmaker or judge – or for the activist prisoners. The prisoners can only get this news in print, and value the free copies of each issue they receive. 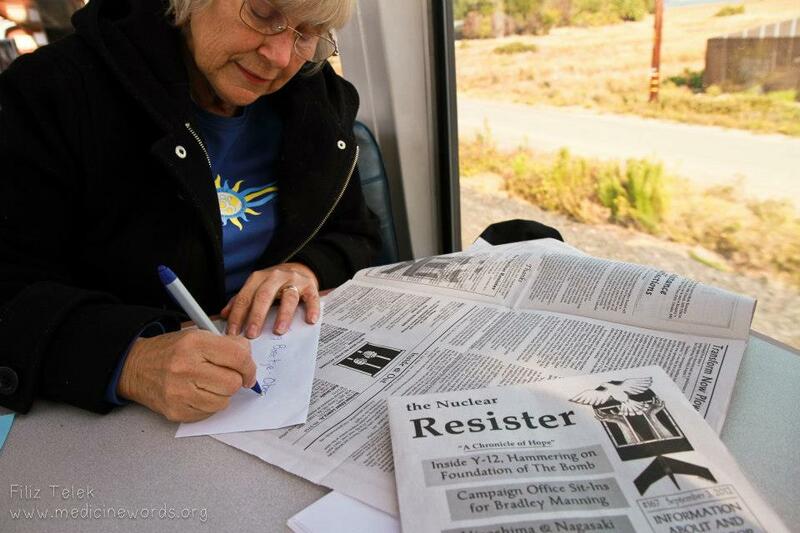 The Nuclear Resister will keep you up-to-date with nonviolent actions for a peaceful and nuclear-free future, trials and sentencings, writings from prisoners, future actions, prisoner addresses, support needs and more. Just $25 brings you into the heart of this important network for the resistance movement. In the ongoing struggle for peace there are those who give us hope and inspiration. For the past 33 years The Nuclear Resister has done just that, and I am deeply grateful for their wonderful work for peace and justice. The Nuclear Resister has been a great encouragement over the past three decades, putting our many modest efforts into context together in a global and historic perspective. Not only is this paper vital to keeping activists in touch with each other, the stories told and opinions raised in The Nuclear Resister are among the most crucial being published anywhere in these critical times. The Nuclear Resister tells the story of the courageous women and men who have struggled to abolish war, and in so doing inspires others to join the work. You can make checks payable to the Nuclear Resister and mail to P.O. Box 43383, Tucson, AZ 85733. Donations of $50 or more can be tax-deductible if made payable to the Progressive Foundation.